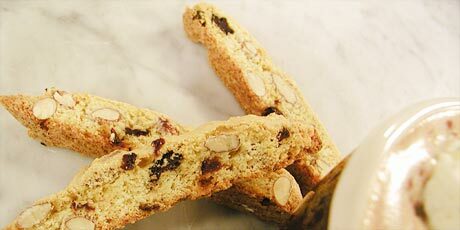 These biscotti are nicely spiced with anise and look very festive with dried cherries. Great for dipping in your morning coffee! 2. Line a large baking sheet with parchment. Brush the parchment with butter. 3. Sift flour, baking powder, ground anise and salt into a medium bowl. Add almonds and cherries. 4. In another bowl, add lemon zest, sugar, oil and eggs. Whisk until smooth. Add the egg mixture to the flour mixture. Stir with wooden spoon and blend well. 5. Divide dough in half and shape each into a cylinder (roughly 12 x 2-inches). Dough will be sticky so use a little oil on hands to shape dough. Arrange the cylinders on the baking sheet, leaving at least 3-inches – they will spread out as they bake. 6. Bake for 30 to 35 minutes or until golden and firm. Remove from oven and let stand for 15 minutes before cutting to keep shape. With a large spatula carefully scrape cylinders off tray and transfer to a cutting board. Carefully slice crosswise on the diagonal with a serrated edge knife (in one full cut) into ½-inch slices. Put slices back onto the baking sheet, laying flat and not overlapping. Bake a second time (again at 325 degrees F.) for 20 more minutes or until golden brown and crisp. Makes about 40 cookies.